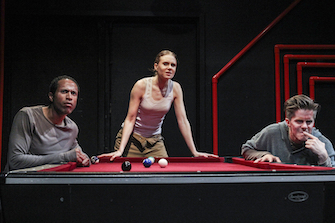 Kwasi Osei, Christiane Julie Seidel and Morten Holst in Then Silence. Photo by Kait Ebinger. BOTTOM LINE: A confounding contemporary allegory about the devastation of human nature. Then Silence opens on a stark stage adorned with a pool table, two metal chairs and a system of red piping on the upstage wall. Before the house lights even dim, the actors enter from outside the theatre, take the stage and begin to play a lengthy game of billiards without dialogue. They carry on for a few minutes this way until One (Kwasi Osei) breaks away from the other two, stares out to the audience at an unseen man and declares, “A man at a distance from two other men.” The others, Another (Morten Holst) and Brother (Christiane Julie Seidel) ask him series of questions about the man he sees and why he is there. After some deliberation as to motives and relationships, there is a flash of light and the three are now acting out the scenario they just described. The first vignette is an interrogation scene, with One and Another playing the interrogators and Brother as the prisoner. Occasionally, the three step out of their role-playing to discuss the options of how the story will unfold, but then with another flash of lights, the scene is abruptly over. There is a short pause in the action until Another steps forward and offers a different story line, beginning again with, “A man at a distance from two other men.” The trio work their way through ten scenes in all, covering many darker aspects of human behavior, from infidelity to conquering countries. Penned by Norwegian playwright Arne Lygre and translated by May-Brit Akerholt, Then Silence is an ambitious effort. The driving force of the action rests on the idea-heavy scenes and an underlying lament for the selfish plight of humans. Director Sarah Cameron Sunde has her work cut out for her to bring this very intellectual script with sparse text to life in an engaging way. The play feels a bit like Sartre’s No Exit in the sense that three characters are trapped in a purgatory-like existence; however, Then Silence gives little indication of time, place or relationship in this world. For example, it’s hard to decipher if the pool table—the most prominent set piece on stage—is included to indicate if the setting is in a bar or a prison or in some other realm. It is never explained. Further, the shiny black and red set elements by Laura Helpern, and earthy, textured costumes by Joseph S. Blaha both add visual interest, but overall don’t quite mesh well together. On the other hand, lighting and sound design, by Derek Van Heel and Brenda Bauer respectively are extremely helpful in distinguishing between the role-playing scenes and the present. The moments that come across the most clearly are mainly to the credit of Seidel, who has a grounded, naturalistic delivery that is enjoyable to watch. Holst and Osei, while fully committed to delivering this story to the audience, adopt a more presentational style of acting that often keeps the audience at a distance. About six scenes into the ten, I began to hope something will be revealed as to who these characters are and why they are here; but regrettably, the play ended with many unanswered questions left open for interpretation. But perhaps that is the point of the piece—to draw your own conclusions or to slowly drown in the possibility that you may never fully understand why. (Then Silence plays at the The Lion Theatre at Theatre Row, 410 West 42nd Street through June 19, 2016. The show runs approximately 1 hour 20 minutes with no intermission. Performances are Tuesday-Friday at 8; Saturday at 3 and 8; Sunday at 3. Tickets are $41.25. Tickets are available at Telecharge.com or call 212.239.6200. For more information visit satcnyc.org). Then Silence is written by Arne Lygre and translated by May-Brit Akerholt. It is directed by Sarah Cameron Sunde. It is produced by Scandanavian American Theater Company. Scenic Design is by Laura Helpern. Lighting Design is by Derek Van Heel. Costume Design is by Joseph S. Blaha. Sound Design is by Brenda Bauer. Nzinga Williams is the Stage Manager. The cast is Morten Holst, Kwasi Osei and Christiane Julie Seidel.